HDMI Extender over CAT5/6/7 up to 60m with IR. 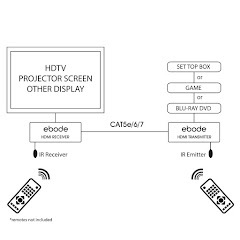 The ebode HD60IR HDMI extender is a cost effective solution to transmit HDMI signals over single CAT5e/6/7 cable up to 60m. With 60 meter transmission the HD60IR is suitable for family use while it offers professional specifications, supporting Full HD1080P, 3D and high quality HDMI 1.3 transmission. IR signal transmission to control the source device with your existing remote and build-in HDMI loop-out for local display are embedded. The ebode HD60IR is HDCP compatible and also supports Digital Audio and BluRay Disk which makes it an ideal solution for family use and CCTV monitoring. Transmission length: CAT6 to 60 meter on 1080p. HDMI over single CAT5e, CAT6, CAT7 cable transmission up to 60m./196 ft.